Lay dropcloths down on your bathroom floor to protect it and make cleanup easier. Then, remove the bathtub stopper. After that, use a screwdriver (or tool designed for tub drain removal) to remove the drain and the overflow drain cover. After that, locate the pipes that are attached to your tub. You may be able to access them if you have a basement or garage below your tub. If you don’t, you may have to use a drywall saw to cut a hole in your drywall. If your bathtub is surrounded by three walls (aka an “alcove”), you’ll need to cut away a section of drywall on each side. Choose a standard measurement (say, six inches) and make several marks above each of the three sides of the tub. Use a straight edge to connect the marks into straight lines. After that, use your drywall saw to cut along the lines and remove the entire section of drywall that’s above your bathtub down to the studs. Locate the screws or nails that attach the tub flange to the studs. Using a pry bar or a screwdriver, remove all of the screws or nails around the tub. Also remove any moulding around the sides. Next, use a utility knife to cut away the caulk between the tub and the floor. To remove the bathtub, you’ll need a friend’s help. 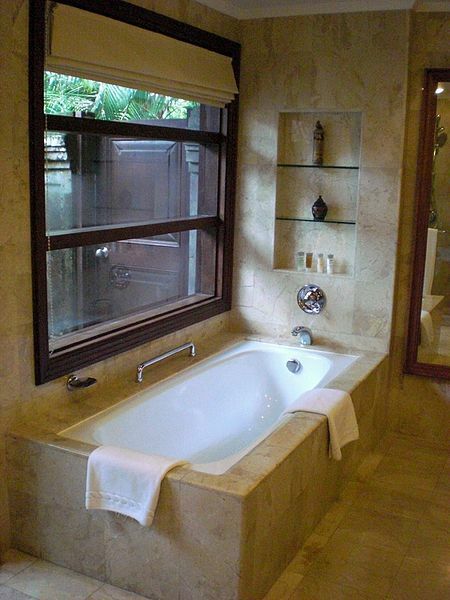 Have your friend lift up one side of the bathtub while you slide your 2-3 1×4 pieces of wood underneath to prop it up. Next, use the 1x4s as skids and slide the bathtub out of the alcove. With the bathtub out, remove any other supports that may be attached to the wall as well as any other leftover debris. Now, you can install a new bathtub or shower.